Have we become so de-sensitized to over-reaching federal agencies that clear violations of the Constitution are simply ignored? Have we just resigned ourselves to a behemoth Government? I was appalled to realize that this story is actually a couple months old, yet I knew nothing about it until PLW heard it mentioned on a podcast. It seems that the Environmental Protection Agency has declared that Riverton, Wyoming is part of the Wind River Indian Reservation, undoing a 1905 law passed by Congress. This has understandably angered state officials. So, let's look at this story from a Constitutional aspect. The EPA is an agency of the U.S. federal government which was created for the purpose of protecting human health and the environment by writing and enforcing regulations based on laws passed by Congress. It seems that the Wind River Indian Reservation submitted an application to get funding for air quality monitoring under the Clean Air Act. Somehow, the EPA determined that this application qualified the Reservation to be treated as a state, and the EPA decided that the boundaries established by the 1905 law were not to be honored. 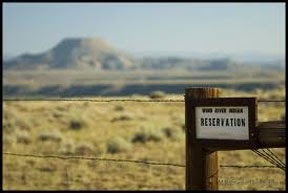 The EPA then granted the tribes' claims that the Wind River Reservation actually extended over 1 million acres beyond the boundaries that the 1905 law established. I have to agree with state officials, who have filed a stay against the EPA's decision to revise the boundaries, by stating that the agency has effectively overruled an act of Congress. And why isn't anybody screaming about the Tenth Amendment? It clearly states that "The powers not delegated to the United States by the Constitution, nor prohibited by it to the States, are reserved to the States respectively, or to the people." Where does an Agency (who is bound by the laws of Congress) get off thinking it can overstep its authority and ignore the State and the people of Wyoming? Everything is upside down in our government! Why isn't Congress calling the EPA on the carpet for stepping outside their jurisdiction? Why is the Wyoming Congressional delegation appealing to the EPA, as if the Tenth Amendment doesn't exist? This whole controversy arose from a 2009 tax case that the state urged the courts not to drop because of the “implications of ruling on a boundary without the federal government and Eastern Shoshone being involved in the case,” reports the Casper Star-Tribune. State courts have heard at least two cases on the boundary in the last three decades — one 1980s Wyoming Supreme Court case found that Riverton was part of the reservation, and another state high court case in 2008, which found that the town was in Wyoming. Back in 2009, State Attorney General Marty Hartsocg had this to say: "We don’t have a fully binding decision. We do in the state, but the state is then put in a position of having to rely on the federal government’s view for its direction." Why do they need to rely on the federal goverment's direction?!? Am I just not understanding the Tenth Amendment properly? Or have the States, through time, simply abdicated more and more of their powers to the Federal Government, and hence to the myriad of agencies that have been spawned through a vacuous bureaucratic system? Is this why the Federal Government and their Agency heads feel empowered to grab more and more dominion away from the People? And speaking of the people, what about the 10,000 residents of Riverton? What are the tax, state services and law enforcement implications? Are they subject to the Tribal Police or state law enforcement officers? But the bottom line is this ... why is the EPA allowed to be a part of this decision at all? Is it a surreptitious plot to seize private property and put it all under control of the US government? Sounds crazy, huh? But so did the canceling of millions of health insurance policies just a few short years ago. Here's hoping that the State of Wyoming will uphold its Constitutional rights. The ability for the rest of us to engage in these Tenth Amendment violations may be determined by their willingness to fight back. Proverbs 24:11 "Rescue those who are being taken away to death; hold back those who are stumbling to the slaughter." I think because of Agenda 21 this kind of activity is going to start happening more. We have a government that does not believe in personal property rights. It seems we also have an Attorney General who thinks he can pick and choose which laws to obey, so why would the EPA think they have to adhere to any laws.